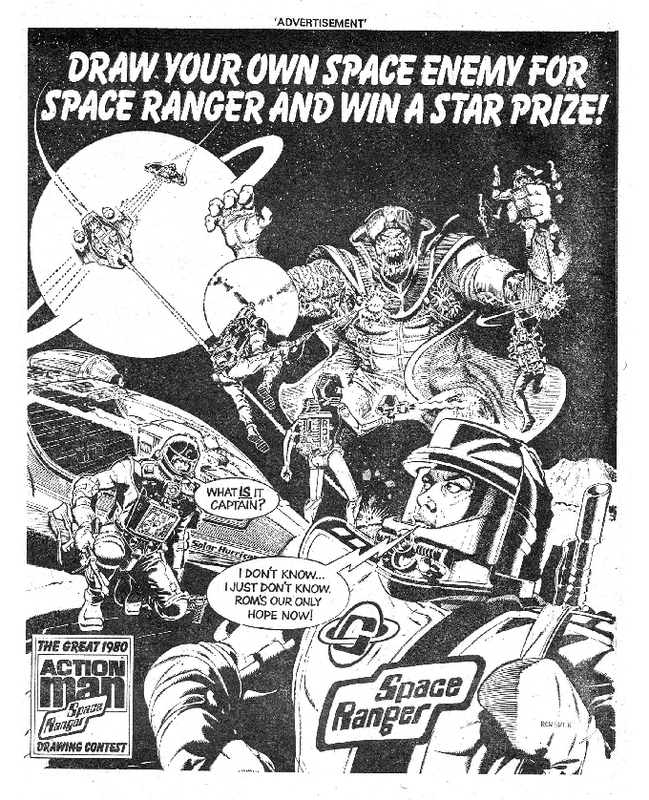 Here's an August 1980 ACTION MAN advert (reprinted from BATTLE ACTION) promoting erstwhile Space Knight ROM's inclusion in the UK equivalent of the G.I. JOE toy line. But... good luck spotting him. The purpose of the advert was - beyond flogging the toys - to promote a drawing competition to design a suitably bizarre alien creature (note: they have to be a "space enemy", no friendly monsters here!) for the suddenly space-bound Action Man (this was post-STAR WARS... and sales of the old soldier were falling fast) to have a close encounter with. So, it makes sense that Ron Smith's extra-terrestrial beastie should be centre stage. But Rom, despite being "our only hope", is barely visible (someone - probably belatedly - obviously spotted this and added his name to his back pack). I imagine Action Man manufacturer Palitoy did a deal with Parker Brothers to import a warehouse full of unsold Rom toys and - rather than sell them as a standalone item - bundled him into the Action Man line to hastily bolster its SF credentials. All this was happening whilst Marvel UK was merrily reprinting the US ROM strips (in FORCES IN COMBAT, FUTURE TENSE and - latterly - STAR WARS) with a completely different continuity. Copies of the original US books were also appearing in British newsagents, as part of the monthly consignment of imported US Marvels. A cool thing indeed for any curator of ROM Spaceknight. I found this ad last year in 2000AD prog 170 (26-Jul1980), and wasn't aware yet that it appeared in other books. Can you please let me know what issue(s?) of Battle Action had it, and what other comics might've? Thanks again! Hello there. Thanks for stopping-by again. This advert was published in BATTLE ACTION cover-dated 9 August 1980. I'd have to go back and see if it appeared any other weeks although I suspect this was the first (and - possibly - only time it ran in that weekly). I'm not sure if it appeared anywhere else. It's possible that Palitoy's advertising agency bought space (ahem) in a number of different IPC weeklies, possibly rolling it from title-to-title (starting with 2000AD... then BATTLE ACTION the following week... and then who knows where). I don't have copies of other IPC weeklies from July/ August 1980 so I can't check. It may also have run in DC Thomson's similarly-themed comics (WARLORD, VICTOR and others) but - again - I can't check. I don't think it appeared in any Marvel UK comics but I'm constantly uncovering things so I can't be 100% certain. Actually, I can now correct myself. I found a copy of M-UK's RAMPAGE MAGAZINE issue 27 (dated September 1980) at the weekend and it included the above ACTION MAN promotion. Which opens-up the possibility that it appeared in Marvel's other September '80 monthlies... and possibly the weeklies as well! you've got a great blog here. i've found some good Rom related stuff here in the past for my ROM blog. Also appeared in Speed or Tiger & Speed Comic in late 1980 or early 1981 . I'll have to look up date the two Comics merged .